A gathering of the news, events and stories from all around the SF Bay Area. Event - 2018 Toy Drive! It was November of 1994, I think. I’m pretty sure. I was with a community radio station and I felt that we weren’t doing enough “community.” I organized a food drive at a city event and we rallied the staff together to do some good. There we were in the downtown square, taking in canned and boxed goods and having a jolly old feel-good time as we stayed live on the air – interviewing people, hearing their holiday plans, playing their requests and giving away prizes. While I was mid-broadcast, a scruffy looking gentleman approached us with a solid frozen turkey under each arm and a couple more swinging by the handles. He shoved one at me and dropped the others into our barrel. “Happy Thanksgiving. Good thing you’re doing.” and off he trotted. I stood, dumbstruck with a microphone in one hand and swinging a turkey with the other. The number one rule in radio is to never ever have dead air, but I was at a Less Nessman kind of loss. I couldn’t have been more surprised if the turkeys had dropped from the sky. The drive was such a success that I then organized a toy drive the following month. The goodwill and groovy vibes among the others was infectious. And I’ve been doing toy drives every year in the 24 since. There are fewer ways that we can contribute more to our society than to give our time. Over the years, people have contributed by way of donations from their wallets, their hearts, their goods, their time and their space. The Toys For Tots program has been endangered because they lack resources – while many toys fill big boxes all over America, it still takes money to keep the wheels turning. I sure would hate to see the end of this program because of the joy and strength it brings to others. These events get me through my own holiday season, thinking about all of the kids who benefit from each and every person who participates in any way. Please come and share an evening of food, fun and festivity. Put on your holiday hats and have some laughs. We have some great people this year who have promised to entertain you: Stephen Turner, Jeen Yee, Bob Johnston, Larry "Bubbles" Brown, and Phil Johnson! We’ll also have an abundance of raffle items for you to enjoy or regift – consider it a win either way! The atmosphere and staff are friendly, the lights downtown are fantastic to see. Get in a little shopping if you can. And please visit our sponsors/donors listed below. You’ll find links to art, authors, dining and our comedians to keep up on their calendars. 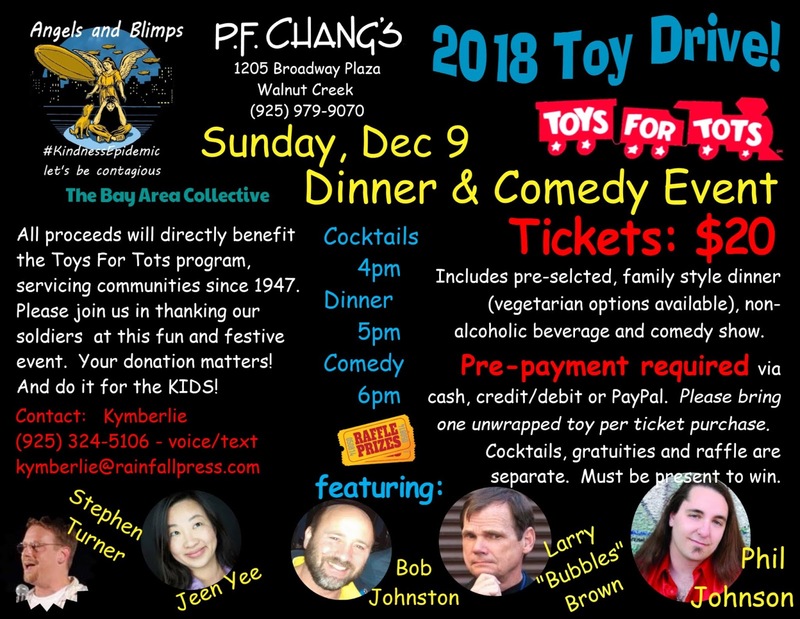 The Annual Bay Area Toy Drive Event!